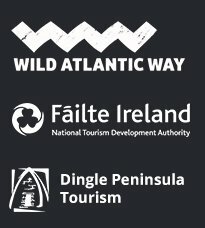 The Dingle Way – Slí Chorca Dhuibhne – is a diverse and beautiful walking trail, full of surprises for those who wander its paths. 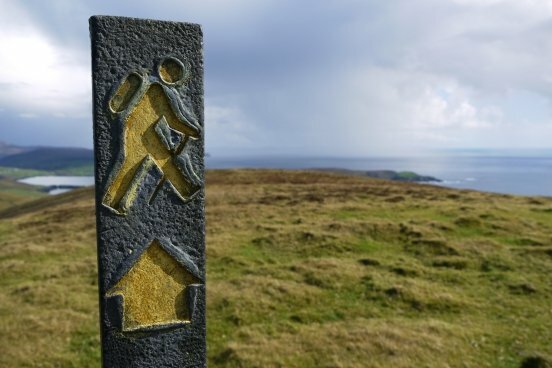 During a week’s rambles over The Dingle Way, you’ll encounter panoramic vistas of sea, mountain and islands, a profusion of unique birds, plants and unspoiled landscape, and an astonishing array of ancient sites spanning 6000 years. Along its 178km (110 mi.) length, The Dingle Way traverses pristine sandy beaches bordering on crystal seas, fuchsia and gorse lined green roads leading through pastoral countryside, heather and bracken covered hills, and mountain passes up to 700 meters (2000 ft.) high. Here, where ancient Bronze Age and Celtic peoples lived for thousands of years, you can enjoy gannets and shearwaters in endless flight above wave battered cliffs, or laugh at rare, red-footed and red-beaked chough dabbling amongst purple Devonian sandstone boulders along the shore. On another day you might delight in multiple rainbows over a verdant patchwork quilt of field and stone as you pause and refresh in the cool quiet glen of an ancient sacred well. The days will pass all too quickly as you explore the magical Kingdom of Kerry! Slí Chorca Dhuibhne is more than nature at its finest … it is Gaelic culture at its best. On The Dingle Way much of your walking will take you through the heart of the Dingle Gaeltacht, one of the few remaining Irish speaking areas in Ireland. Here Irish music, dance and traditional ways live on in a vibrant culture that welcomes you at every turn. In the evening, after your day’s walk, you’ll enjoy home-cooked traditional Irish meals or local seafood in one of the peninsula’s many fine restaurants. Afterwards, there’s traditional music and Irish set dancing to savour at many pubs around the peninsula. 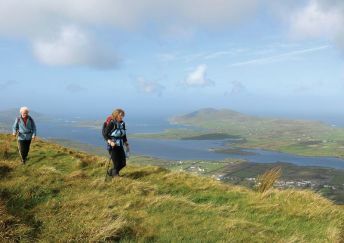 CELTIC NATURE are delighted to offer this 7-day, self-guided walking holiday along The Dingle Way in County Kerry, Ireland. 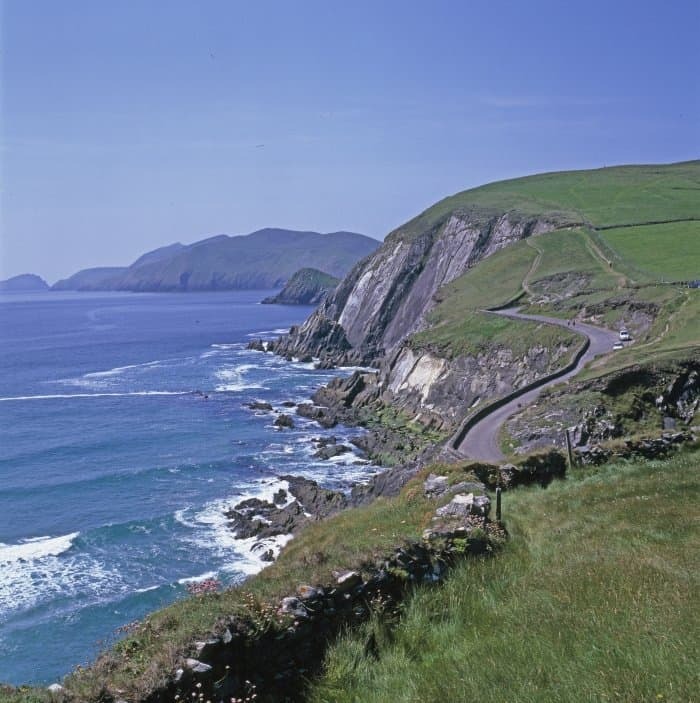 You’ll enjoy the spectacular beauty of the Dingle Peninsula at your own pace, without the hassle of carrying luggage or searching for accommodation and meals. And your holiday can begin on any day you wish as there is no group schedule to contend with. 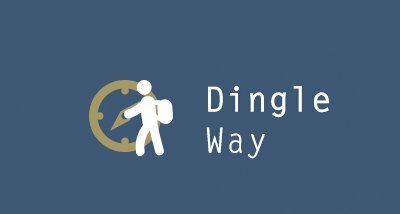 Once you’ve booked our Dingle Way holiday, you can relax and savour the walking, knowing that we’ll handle all the details. We’ll arrange 7 outstanding B&Bs, 4 fabulous dinners, and all your lunches while you are walking. We’ll have your luggage waiting for you at the end of every day. And well before you head off for Ireland, we’ll send you a complete itinerary and a detailed DingleWay Guide. We have train and bus schedules on hand too and can help you set up your travel to Tralee. While you are here, we’re never more than 20 minutes from you by car should a problem pop up. You will be well taken care of! 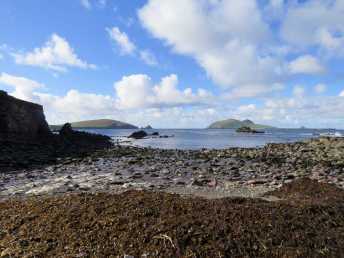 The 2019 tariff for our “Walk The Dingle Way” Holiday is Euro 775 per person sharing a room. There is a Euro 240 single supplement. Enquire All walks are customisable to suit your timeframe. Rest days are optional. We would be delighted to help you plan your perfect itinerary. There is always an option of a guided day with Kevin to help you appreciate this deeply cultural landmass at the edge of Europe.